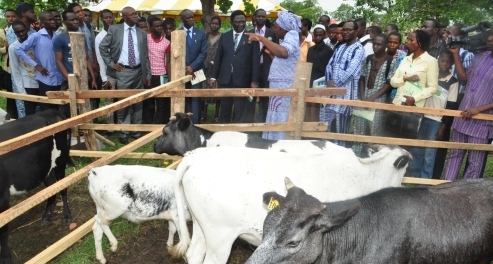 At a ceremony organised by the Directorate of Sports, athletes from the Federal University of Agriculture, Abeokuta (FUNAAB) departed for the Nigerian University Games Association (NUGA) competition, being hosted by the Obafemi Awolowo University, Ile-Ife. The opening ceremony of the 24th series of the Games began on February 12, 2014 and is expected to run for two weeks, in which FUNAAB would be featuring 172 athletes and 15 officials in 8 events, which is the largest contingent ever produced by the University. The events are Badminton, Squash, Tennis, Table Tennis, Taekwondo, Chess, Athletics and Cricket. 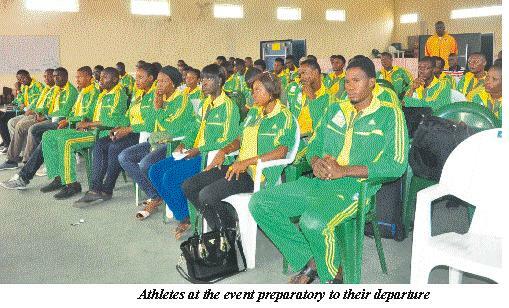 Addressing the athletes at the Sports’ Complex, the Vice-Chancellor, Professor Olusola Oyewole, encouraged the athletes to strive for gold, not only in the event but also in their academics. His words: “Are you thinking about gold? Can you make it? If you have the vision, you can make it. As you are competing in the name of this University, God will raise you up and you shall become leaders of this nation”. The Director of Sports, Mr ‘Bayo Oluwatoki, thereafter appreciated the Vice-Chancellor and the University Management for the full support given to sporting events, adding that the only way to pay back was to return to the University with more medals than that of last year. Corroborating the Director, the Chief Coach, Mr Victor Oshuntolu, said the 2013 event hosted by the University of Benin (UNIBEN) was the 2ndbest performance of FUNAAB in 25 years, as the University won one Gold, two Silver and six Bronze medals. He added that the University placed 27 out of the 72 Universities that featured in the games. The Chairman, Sports’ Committee, Dr Sam Wobo, thanked Management for the moral, financial and academic support for the contingents. He noted that this was the first time a Vice-Chancellor would be meeting the athletes preparatory to their departure, promising that the team would do the University proud.